Weed seed predators can eat up to 90 per cent of shed seeds. Seed predation by carabids is responsible for the greatest impact on the seed bank. Photo courtesy of Sharavari Kulkarni. Wanted: weed seed predators. Salary: work for room and board. Equal opportunity employer: invertebrates such as carabid beetles and crickets; earthworms; rodents such as mice and voles; birds like sparrows and chickadees. Employer willing to improve working and living conditions. Willenborg says the greatest losses are due to beetles and in particular, a genus called carabidae. There are over 900 species of carabidae across Canada, and about 400 of these can be found in the Prairies. At the U of S, Willenborg has two PhD students currently working on several aspects of weed seed predation. The first project with PhD student Khaldoun Ali is looking at the interaction between predators and weed seeds. They are researching what attracts an invertebrate predator to a particular weed seed. Is the attraction smell? Taste? In one study, conducted by his previous PhD student Sharavari Kulkarni (co-supervised with Dr. Lloyd Dosdall and John Spence), they monitored activity of five insect species that were actively feeding on canola seeds. Amara spp. and Pterostichus melanarius, another carabid, were found to be the most active in Alberta fields. Peak activity and density was in late July and early August. The study also looked at spatial distribution across fields in Vegreville, Lacombe and St. Albert, Alta., over two years. The study asked the question, in which part of the field are the carabids concentrated? While carbid density was higher along field margins, they were also concentrated where weed patches were growing. “We thought distribution would be a related to weed seed density in the soil seed bank, but this was wrong. The greatest association was with current weed patches,” Willenborg says. Willenborg says there are several hypotheses on why the carabids were attracted to patches with growing weeds. The first could be that the carabids were attracted to those weedy patches because of the cache of weed seed still present on the soil surface from the previous year. Another reason, and probably more likely, is that the weed patches were providing shelter. A final thought is that the carabids were attracted to the patches by some mechanism and were waiting for the weeds to shed their seeds. Research at Iowa State University by Van der Laat et al. (2015) found that carabids also had preference for certain weed species. The researchers found that carabids had a clear preference for waterhemp seeds over lamb’s quarters, giant foxtail and velvetleaf. However, these are very different seeds in almost every aspect. Willenborg wondered if they took seeds that were similar in size, shape, and color, would the beetles be able to choose between seeds? Would they exhibit preferences? So they chose the Brassicaceae, or mustards, family, which contains many weed species to work with. 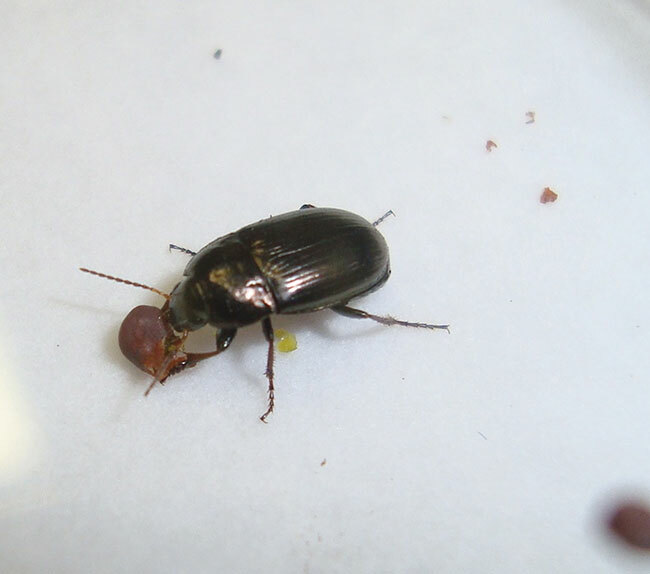 Sharavari’s work, funded by the Natural Sciences and Engineering Research Council (NSERC) and the Alberta Canola Growers Commission, looked at carabid feeding preference on volunteer canola, wild mustard and stinkweed. She used ‘cafeteria’ experiments where beetles are offered a choice of possible seeds and they choose their preferences. “To our surprise, the beetles exhibited clear preferences for volunteer canola, removing almost 60 per cent of the seeds provided every week. They least preferred seeds of stinkweed,” Willenborg says. To find out why carabids have feeding preferences, they set up an experiment with an olfactometer where the beetles get a choice between the smell of different seeds and make their choice by moving into an inlet where the smell is coming from. It’s like walking by four different restaurants and choosing between the smells of BBQ steak, fish, curry, or octopus. Willenborg says the result showed that in all cases, the carabids preferred the smell of canola over the others, and actually avoided stinkweed, but the choice depended on carabid species to some degree. “We now think it is olfactory cues associated with seed selection and suspect that, in the case of wild mustard and stinkweed, the high levels of gluccosinolates and euricic acid deters the beetles,” Willenborg says. The other research project with PhD student Stefanie de Heij is looking at weed seed predation in pulse crops. Little research has been done in this area except in soybeans in the United States. This research is investigating what insect species are eating weed seeds in different pulse crops. They are also looking at when the predators emerge, when they are active, and how many weed seeds they are consuming. 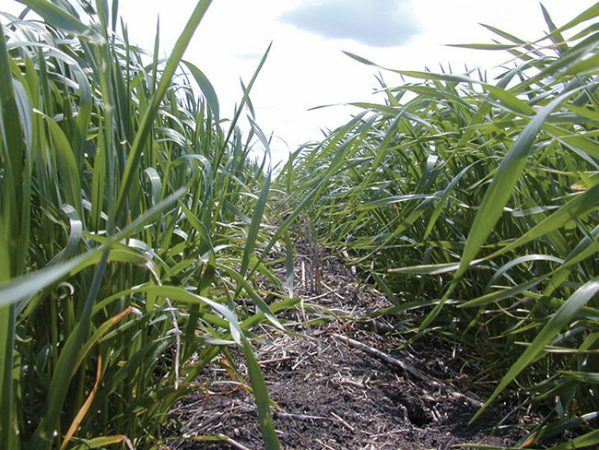 Additionally, with different levels of crop cover between pulse crops, the research is looking at what agronomic practices can be implemented to harbour weed seed predators. This work is being funded by Saskatchewan Pulse Growers, and would not have been possible without the support of growers. Crop residue in no-till fields provides cover for seed predators. Photo courtesy of Chris Willenborg. Willenborg says that relatively little western Canadian information exists on how to encourage weed seed predators, but research in other areas of the world provide some strategies that farmers can implement. The first is to increase cropping system diversity. Different crops can harbour different seed predators at different times, so more diverse systems could lead to greater numbers of different seed predators feeding on more weed species. The establishment of beetle banks could also help sustain populations. These can be shelterbelts, grassed water runways, fence lines and grass margins around sloughs. “The idea of beetle banks is to create buffers in the fields that harbour beneficial organisms, including seed predators,” Willenborg says. Cover crops also provide shelter to seed predators from their own predators. Avian predators feed on seed predators including insects, voles, and mice. Cover crops and other sheltering habitat provide cover for the seed predators to hide under. Similarly, reduced and no-till fields also provide shelter for seed predators, as well as provide a habitat for overwintering. With the same logic, improved canopy closure can also help to provide in-season cover and a better habitat for seed predators. It can be accomplished with narrower row spacing; but moving to wider row spacing could have a negative impact on the level of seed predation. This is something that needs to be investigated as the trend to wider drills with fewer openers on wider spacings continues in Western Canada. Willenborg says some insecticides can have a large negative impact on predators. This impact reinforces the importance of only spraying for insect pests by following economic threshold guidelines. He says many carabids are also omnivores, and besides eating weed seeds, they also eat the larvae of other insect pests. Some herbicides, such as glyphosate, can also negatively impact carabids. For example, Brust (1990) reported that certain species of carabids were slower to return to glyphosate-treated areas compared to an untreated control. However, some of this impact may be due to the vegetation control provided by the herbicide.